Whether you prefer to wear feminine dresses or distressed jeans, all fall outfits look fabulous with a fun pair of sandals. 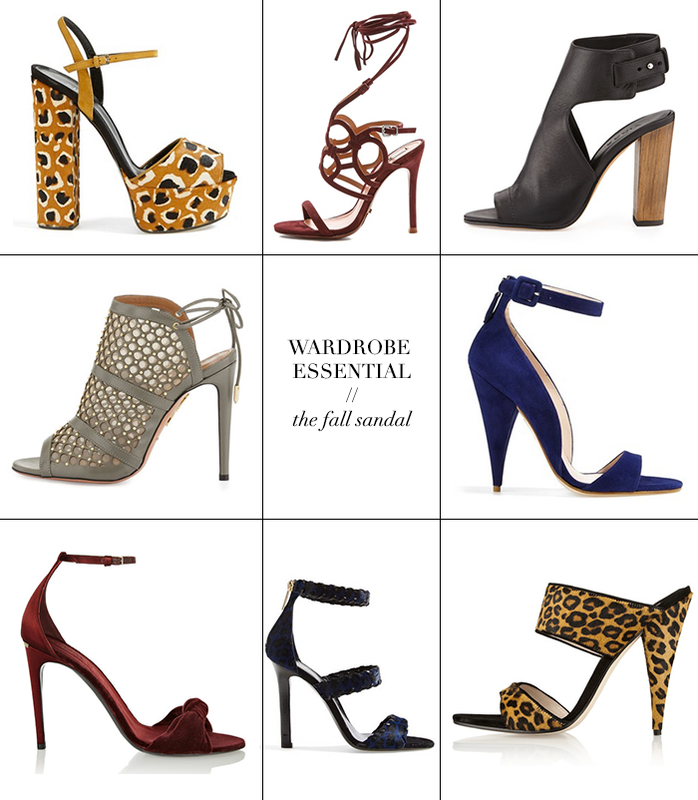 While you typically associate sandals with summer, the heeled sandal is becoming trans-seasonal and I couldn’t be happier about it. I do love a good pump, but I find sandals more comfortable and a little less “9-to-5”. This season I have my eye on two pairs in particular – this pair by Miu Miu is fighting this pair by Aquazzura for the number one spot on my most-wanted list. Which is your favorite? Can they all just magically appear in my closet? I’m starry eyed for that navy Miu Miu pair! STAWP. I have nooooo control when it comes to shoes and this is killing me girl! Great picks! I’m loving the blue Miu Miu pair and the Aquazzura pair! oo baby those cheetah mule-esq ones rock! Obsessed with the grey honeycomb heels. Gorgeous selection. Coveting those Tamara Mellon calf hair sandals!!! Want? Need? Both! Love your finds! The miu miu’s… yes please! Oh MAN. I had to do it. The Gucci Pair. Amazing curating, Girl!!!! I always find it iffy to wear sandals in the fall, but you have convinced me otherwise! I am in love with that Gucci – the colors are perfect! Can I pretend I can walk in all of these without falling on my face? :) They’re so hot!